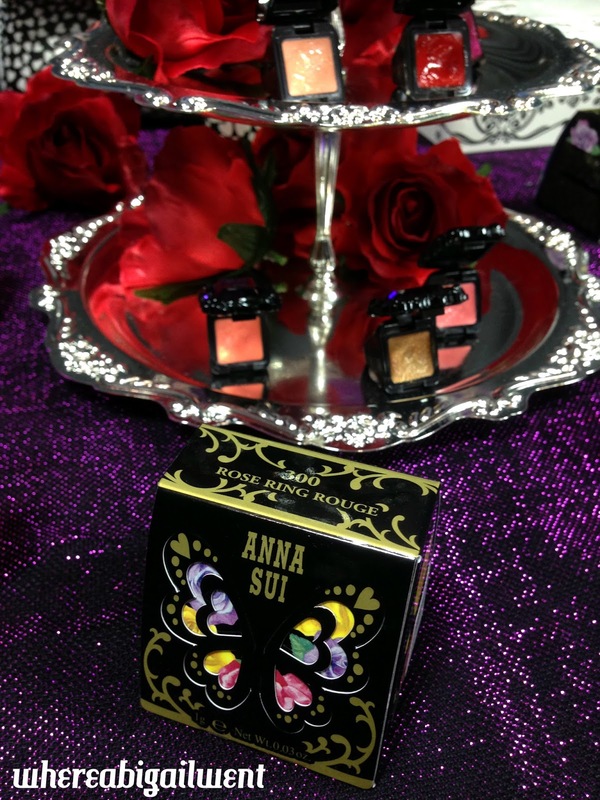 This Autumn's collection celebrates the 15th Anniversary of Anna Sui Cosmetics, and as part of promotional efforts in Singapore, a series of workshops were held at Isetan Scotts to showcase the latest products and looks from the runway. M caught wind of it from somewhere and signed us both up for a session, because she knows I adore this sort of thing. For the session, the event hall on the 4th floor of Isetan was transformed from an extension of the household department, to an exclusive boudoir jam packed with cosmetics and redolent with the scent of tea roses. 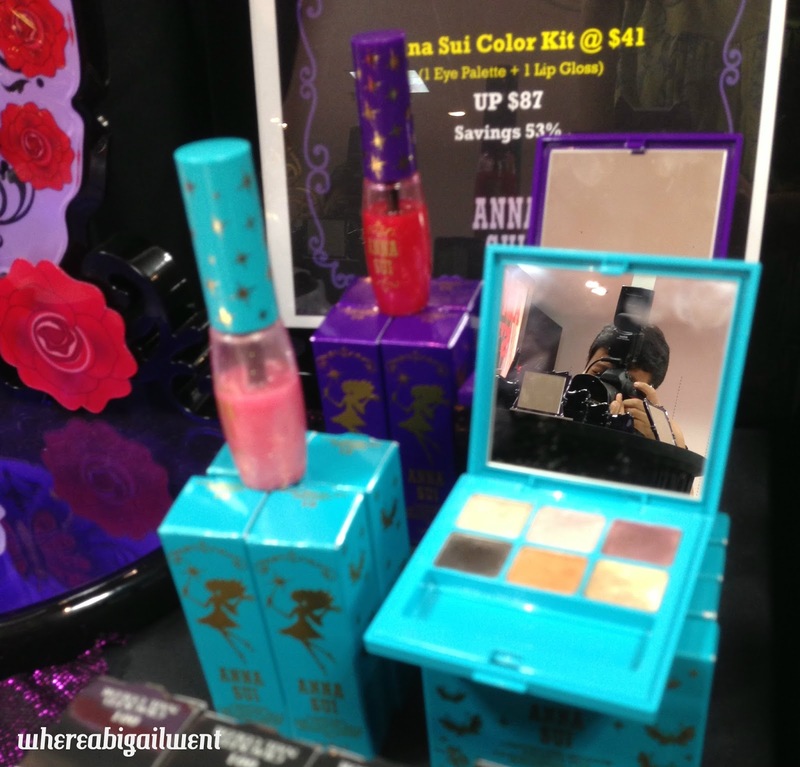 Anna Sui Cosmetics was also responsible for my first eyeliner (A navy blue pencil liner), my first foundation (Powder, in a Dolly Girl compact, used mainly for performances when I was in dance and drama), my first mascara (Clear, with sparkles. Unfortunately the sparkles never seemed to adhere to my eyelashes and I mostly just stabbed my eyeballs trying to apply it), my first nail polish (A beautiful eye-poppingly bright red) and my first eyelash curler. 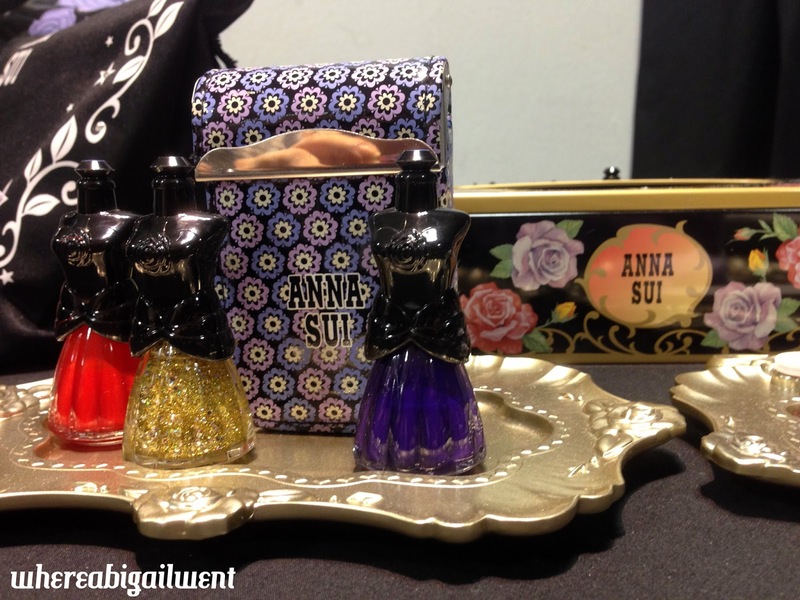 With all the stuff we bought, we received all manner of samples and free gifts, so I also had a whose shelf full of Anna Sui perfume miniatures, cosmetics pouches, tins (Super useful stuff. As class treasurer I used to keep our funds in one of these. ), combs - the works basically. My obsession mainly stemmed from the utterly gorgeous packaging and product designs. The ornateness of the packaging makes them more like accessories - I used to dream of having a vanity table where I could place the brand's loose powder, which looks like a miniature black chest with roses all over. 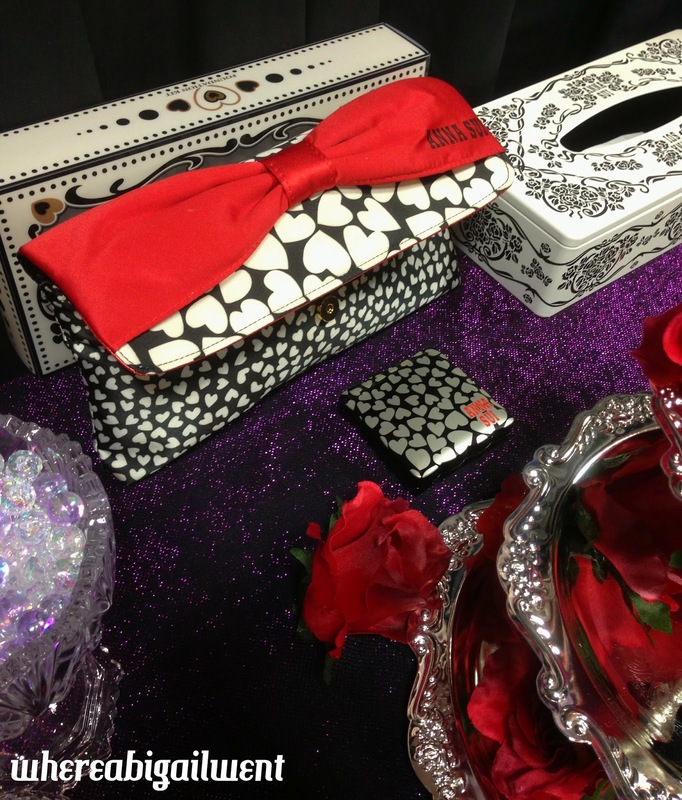 Everything by Anna Sui is very unabashedly feminine, and made fun with the incorporation of goth and punk elements. 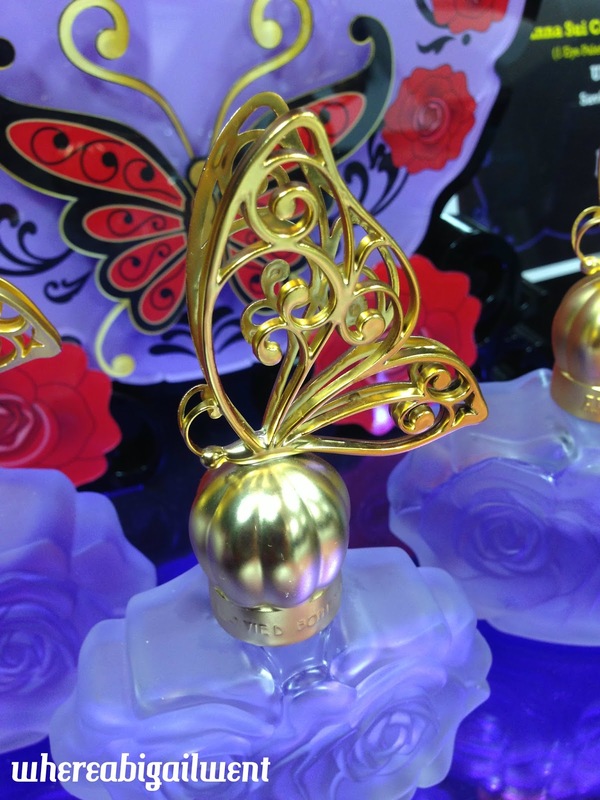 That everything smells divine because of the use of tea roses to scent the products was also another major factor. 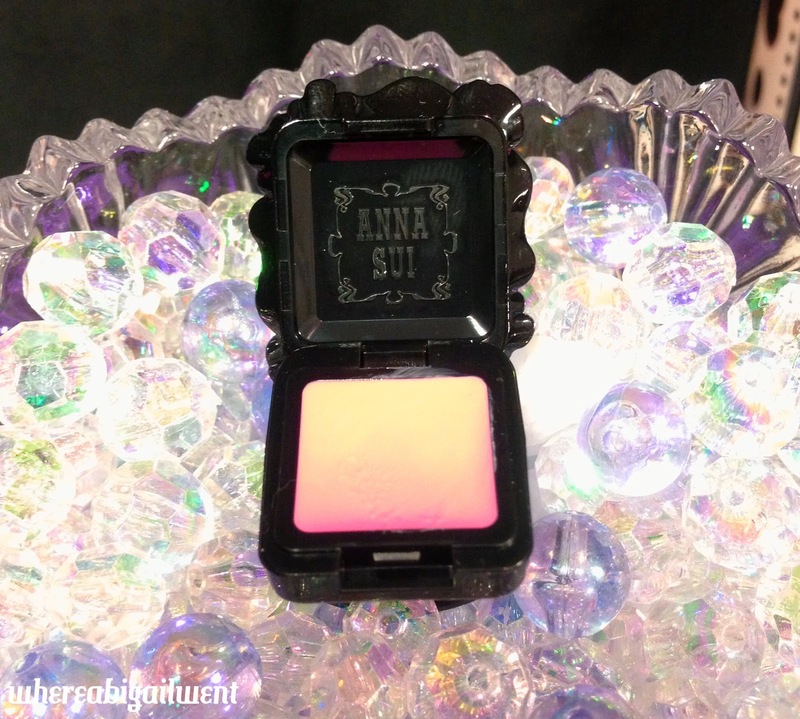 Before this afternoon's session though, it had been ages since we last bought Anna Sui cosmetics. 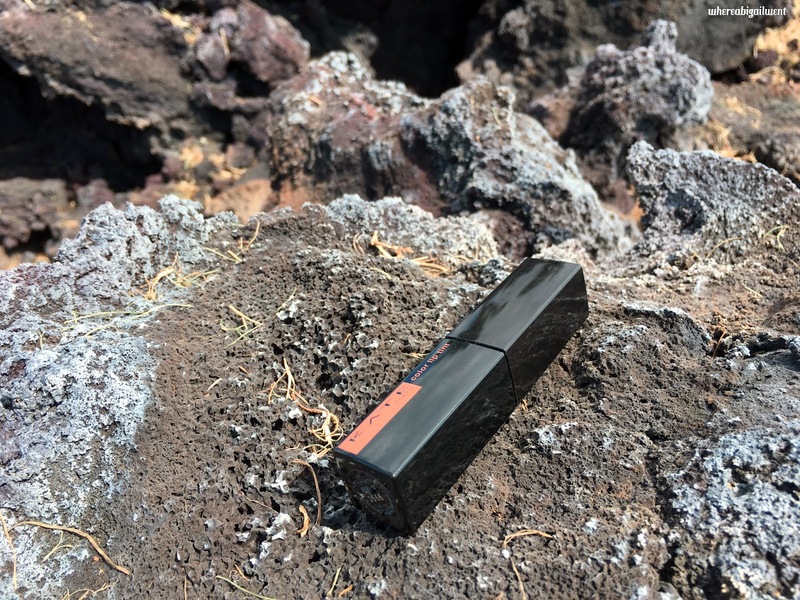 After our favourite promoter left, we just sort of stopped and only popped back once in a while for a look-see at the latest packaging or lip colours. I am, alas, too lazy to doll myself up on a regular basis, so any purchases I might have made never seemed justified. So I was psyched for the workshop. Workshops are the best - they're fun as part of a day out, you learn something new, you get to try out all the things that are being promoted, and whatever you pay to participate you get back in kind, along with a tonne of discounts you otherwise would never see plus other free stuff. (Hooray!) It's the perfect place to get (back) into buying something. There was also the introduction to the latest line of ring rouges. This incarnation features a purple "gem" surrounded by very Anna Sui roses. Inspired by a vintage ring given to her by her mother, which she wears every day as a good luck charm, the iconic ring rouges are apparently Anna Sui's way of sharing a bit of that magic with her fans. I used to have a ring rouge with a cap shaped like a rose, but it's long lost now. M wanted to get this one for herself, but sadly the one-size only ring didn't quite fit. Melissa got the ball rolling with a quick-fire trivia round where I won samples of their shimmering primer and liquid foundation, before moving on to teach us a nifty trick to employ when picking out lip colours: paint different colours on both sides of your lips, then use a piece of white paper to cover one half of your face then the other, to give you an immediate comparison as to which is more suitable for your skin tone and desired look overall. Swatches of lipstick were applied on the backs of our hands by Anna Sui staff, allowing us to see the intensity of the colours and feel the smoothness of application. Then, we got down to creating the runway look. First though, we had to set the base. 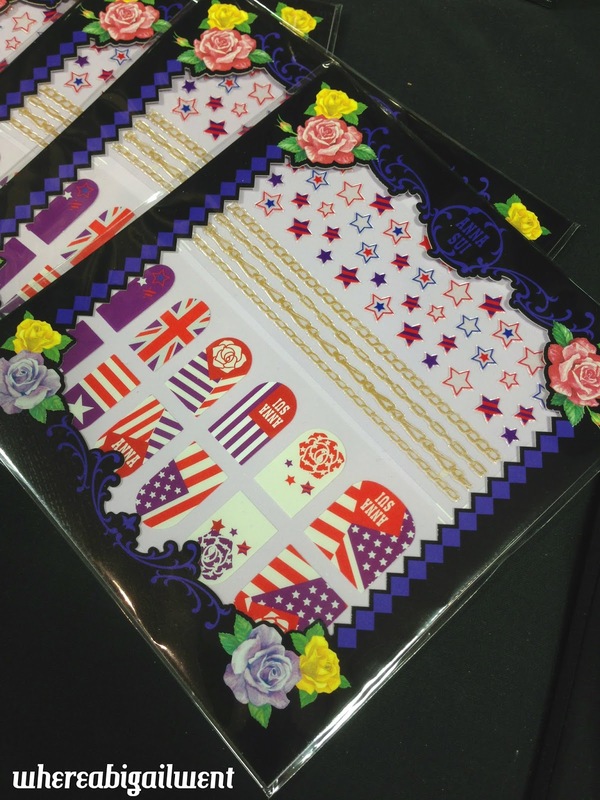 Pale purple brand's own cotton pads were distributed for us to try on the backs of our hands, the first piece liberally doused with Anna Sui Balancing Cleanser, followed by one containing the Anna Sui Balancing Lotion. 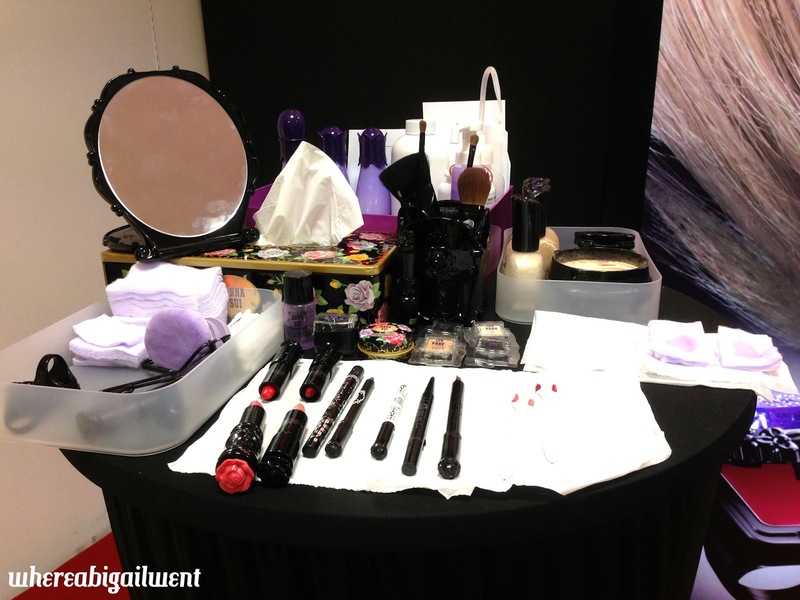 As the demonstration worked its way through primer, foundation, illuminator, blush and eye pigments (Pencil, Liquid and Shadow for intensity and mascara for added drama), products were passed down the rows for us to experience. 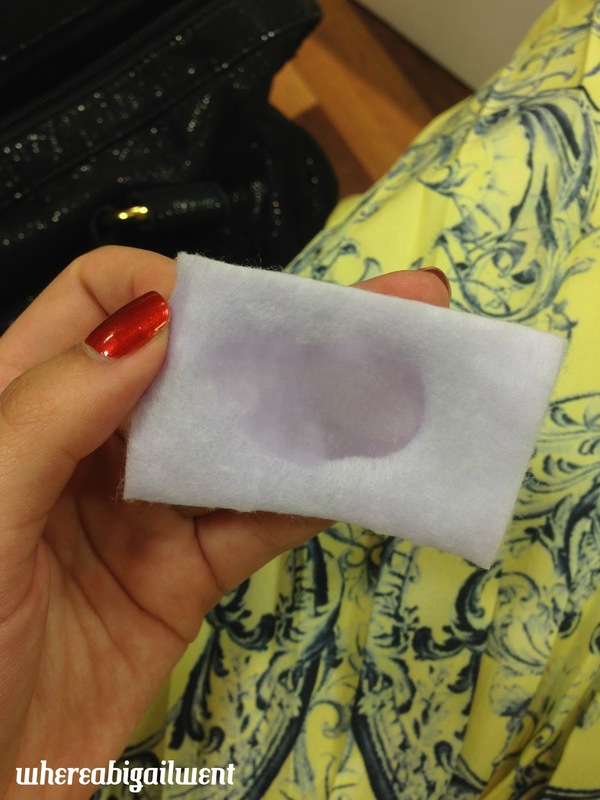 Even the cotton pads are purple! 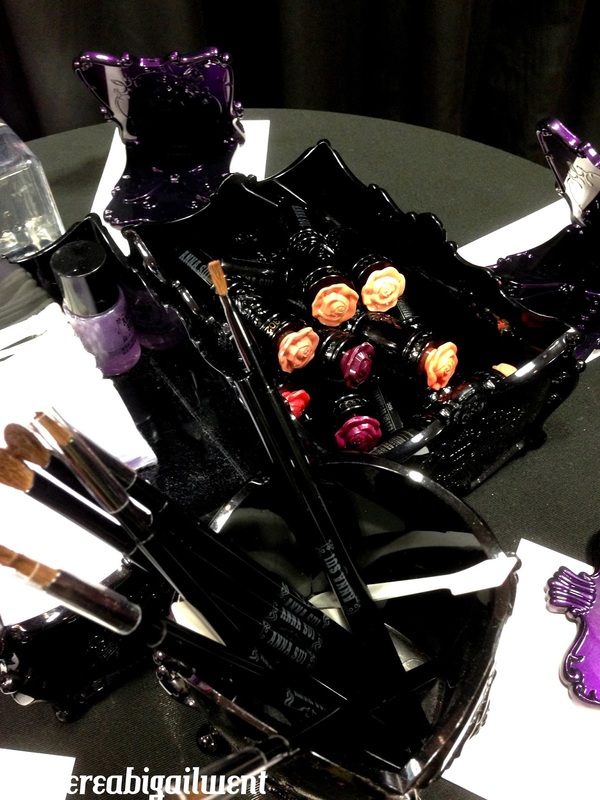 Once the workshop was concluded, I ran over to the table where express manicures were being provided using Anna Sui's nail colours. The current incarnation of bottles look like mannequins wearing richly coloured ball gowns, but contain the same addictive smell of tea roses as the rest of the products. Nowadays scented nail polishes may be all the rage, but these pioneering ones still smell the best. The manicures were done by the lovely Zellyn. I watched her paint a set of perfect coloured french tips (Using the deep bold purple) for one of the other participants before the demonstration got underway, and got myself the first slot once the workshop was over. For me she did a quick colour change - the bronzy vermillion I painted over a week ago was cleaned off with some Anna Sui Nail Polish Remover and some quick filing was done before Zellyn meticulously painted on two coats of the midnight grey N017. She topped this with a clear sparkle gloss from a previous collection that came with a mix of glitter sizes. 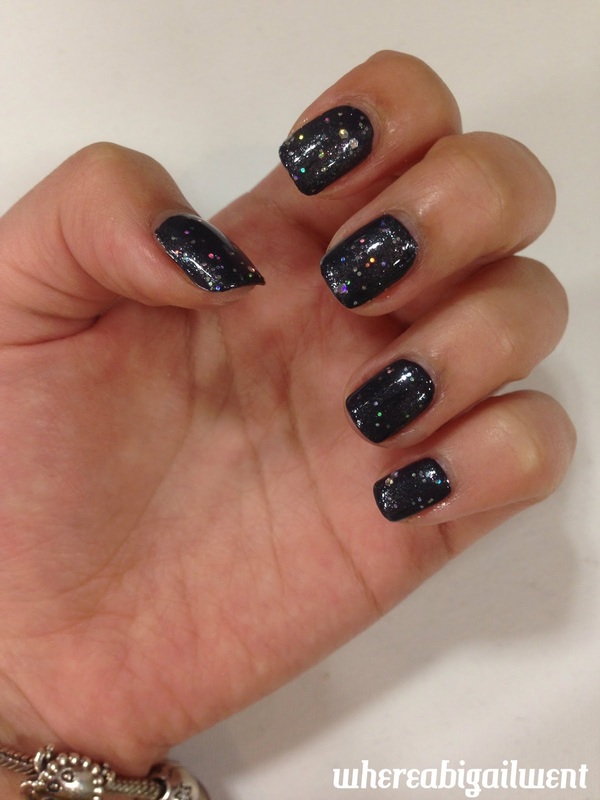 The result: like stars in a night sky. 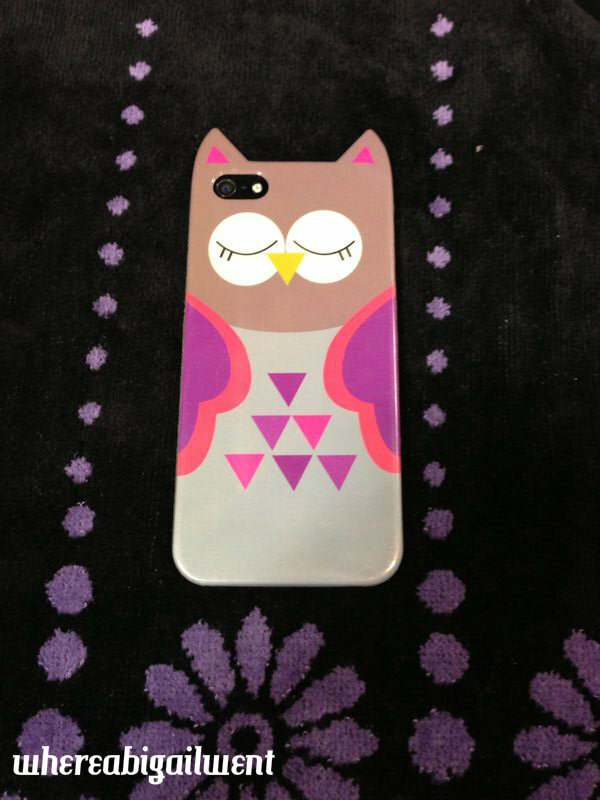 I was amused to see that my phone case matched so well with the Anna Sui towels laid out on the manicure table. 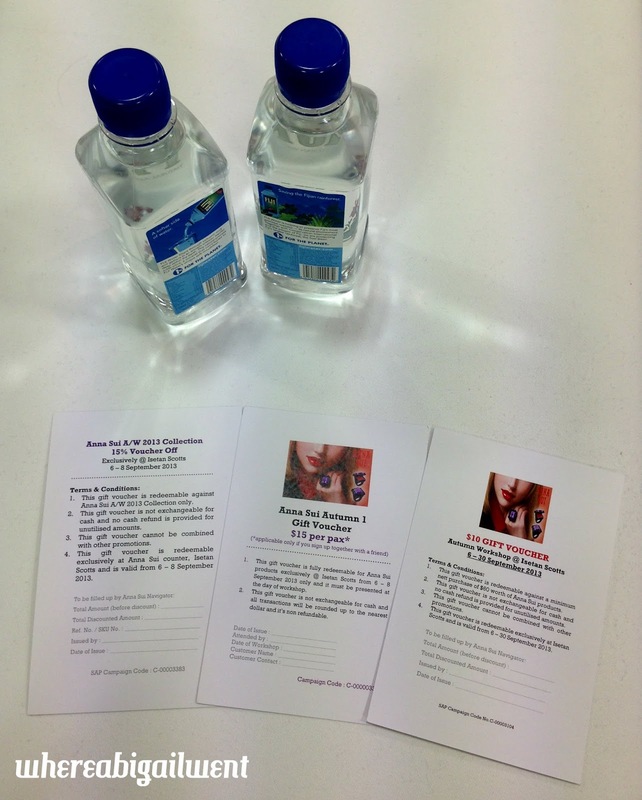 With the vouchers, M bought herself a foundation to replace her rapidly depleting current one, and opted for the limited edition hearts case, which came with a pouch containing skincare miniatures. As for me, I caved into childhood temptations and got the loose powder. Still no space for a vanity table in my room, but hopefully this will stop my face from looking like an oil slick by mid-day. 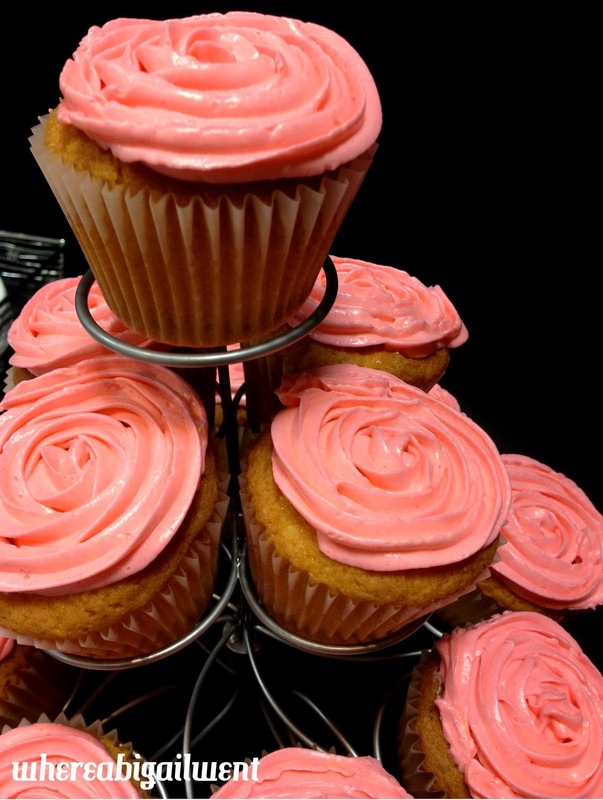 Nowadays, no event seems complete without cupcakes. M had one before we left, and was delighted to note that the cake base was still soft and buttery. 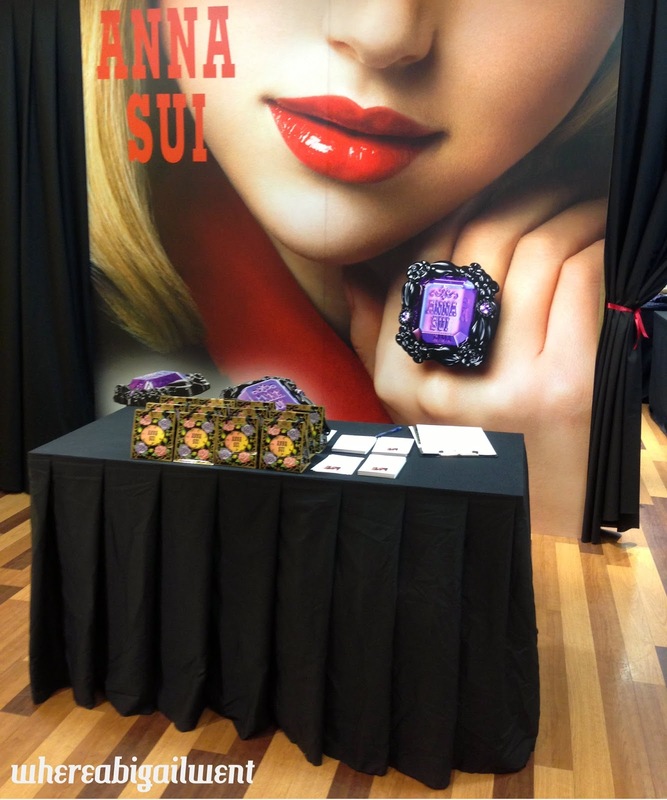 This was the last Anna Sui cosmetics workshop of the year, but hopefully there'll be other things to go for in the near future.